This month I’m looking at another timeless classic, the Rogers Dynasonic. The drum was launched in 1962 in both a wood and metal shell in varying depths, fitted with a unique snare frame often referred to as a snare cradle. The snare frame that held the snare wires evolved through various versions in an attempt to perfect the set up of the wires. The basic premise was to have a drum with floating snares which could be tensioned without putting any pressure on the head. 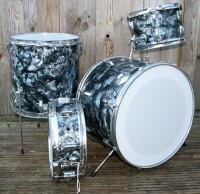 This would require the shell to have no snare beds, which were believed to reduce volume and tone and create choking. 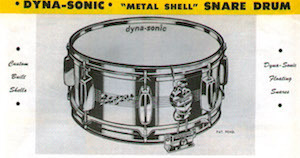 The metal shell Dynasonic is most common in a 5”. The very first metal Dynasonics were thin Gretsch shells, of which only about 200 were made. There were no beads and seven etched lines in the centre of the shell. The next generation of shells had two beads and were a chrome-over-brass (COB) shell, with seven lines around the centre of the shell and Bread & Butter lugs. Like the wood shell drums, these were soon replaced with Beavertail lugs and the shells resolved to have five lines etched in the middle. 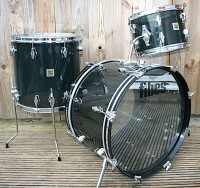 The 1960’s drums feature the script Rogers logo and the Dynasonic badge. The late 1970’s drums feature the Big R badge with Rogers USA lettering. We have a late 1970’s 6.5” Big R in the shop and it’s the only one I’ve ever seen, but they are out there. The earliest wood shell drums were three ply maple/poplar/maple with three ply re-rings. These had stained dark interiors with a clear lacquer. They changed to five ply maple/poplar shells with five ply re-rings and a clear lacquer, around the same time that the lugs were changed from Bread & Butter to Beavertail. Both shell types have reported thickness variations from drum to drum. In the early 70’s wood shells were discontinued until the early 1980’s when the XP8 all maple drums were launched. 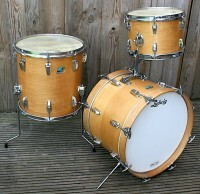 The last wood shell Dynasonics were 10 ply maple with no re-rings (circa 1983). 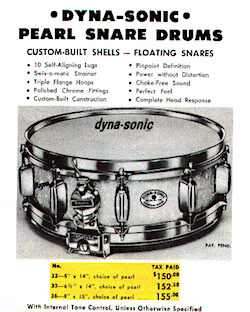 There are varying stories on how the Dynasonic snare drum came into existence. Rogers were certainly looking for a product to bring onto the market to compete with the other American brands. There are claims that it was originally designed for Buddy Rich who was looking for a snare drum that could go from Pianissimo to forte, be extremely resonant, and never choke. The Dynasonic with its precision (0.004”deep, in other words ridiculously shallow, almost non existent) snare bed and cradle mounted wires parallel to the head would answer his demands. The Dynasonic was a great success with estimated sales of 50,000 snares in the 20 years it was manufactured. Not everyone loved the drum, however. Not even all Rogers endorsees! Whether Buddy Rich loved or hated the drum depends on who you talk to, but he certainly played one from its launch up until the end of his Rogers contract. Today, drummers will either claim it is the most responsive snare drum they have ever played, or will dismiss it as being too fiddly to set up and get a good sound. The wood shell Dynasonic from the 1960’s has become highly sought after and commands a high price among players and collectors. Very rarely does a 6.5” wood shell come onto the market, I’ve never seen one, but they do exist. If you see one, grab it! 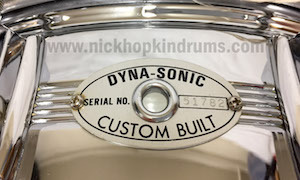 The Dynasonic shells are not unlike other American and English drums from that era – maple with re-rings and chrome over brass. Obviously, the shells have their own characteristics and one can argue that Rogers, Ludwig, Slingerland etc have their own sound. But the sound of the Dynasonic, to me, is very much determined by the snare frame and the way that the snare wires are set up. There are some good articles online about how to set up a Dynasonic and tune the resonant head to maximise the sound that can be achieved from these snares. There are online forums and books available with a much more detailed history of the drum and some of its variations, but hopefully I’ve covered enough to give you an insight to a classic snare drum that maybe you knew nothing about before.